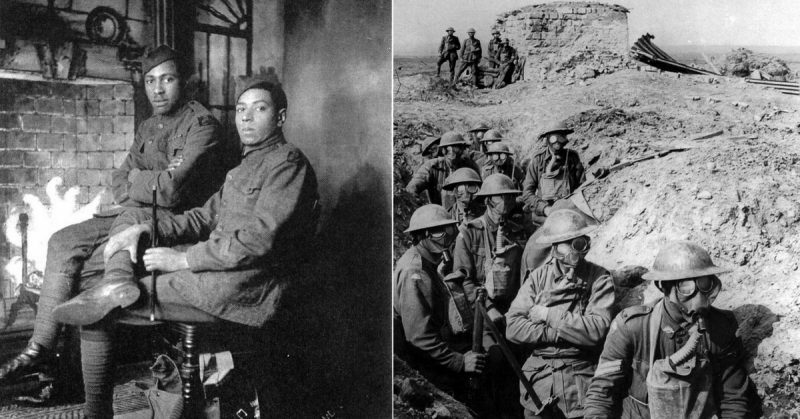 Henry Johnson was a World War I soldier who singlehandedly beat back a German assault while critically wounded. He was a great American hero and received the highest military honor of two different countries. One of those countries, however, his very own, didn’t bestow that medal until nearly 100 years after his service in WWI. The honor this man deserved was not awarded by the U.S. government upon his return home, because he was black. But that racism was eventually overcome, if only by the undeniable memory of his heroism. 15th Infantry, in France, wearing French helmets. In 1917, a young man working as a Red Cap porter at an Albany, New York train station joined the 15th New York National Guard Regiment. 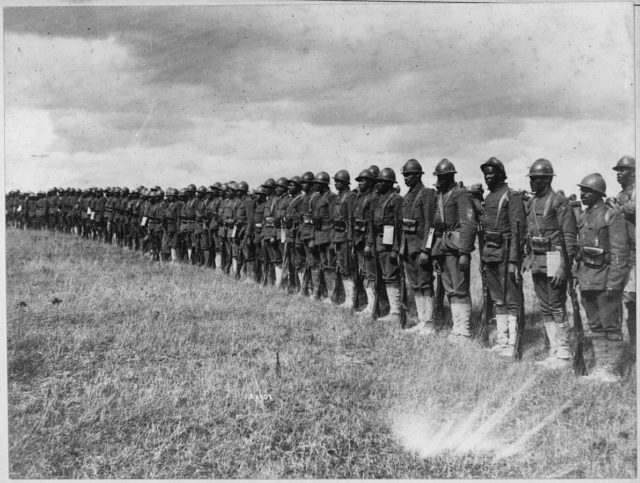 Due to U.S. segregation policies, it was an all-black regiment. Due to be shipped out to France as the U.S. declared war on Germany and its allies, the 15th New York was renamed the 369th Infantry Regiment and placed within the American Expeditionary Force under General John J. Pershing. Johnson arrived in France on New Years Day, 1918. 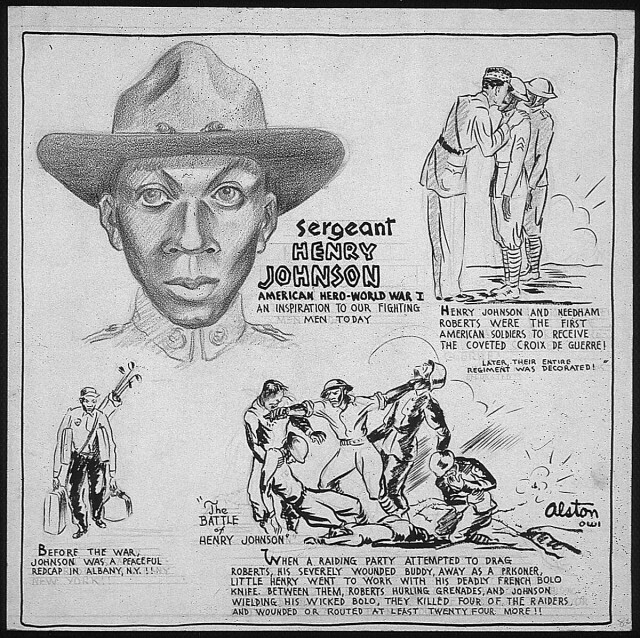 The African-American troops of the U.S. Army were harassed, sometimes even killed, by their Caucasian counterparts who would sometimes refuse to fight alongside them. The officers also distrusted them, harassed them, and issued disparaging remarks and pamphlets to French military and civilians about their black soldiers. Thus, black regiments were very poorly trained and most often assigned to menial labor like carrying supplies and digging ditches and latrines. The French, however, didn’t nearly conform to the U.S. military’s blind prejudice. When their Fourth Army, short on troops, was offered the 369th Infantry Regiment to reinforce their line, they gladly took on the soldiers and put them to use as just that. They were given French rifles and helmets and stationed at Outpost 20 in the Argonne Forest, in France’s Champagne region, just West of the infamous battlefields of Verdun. 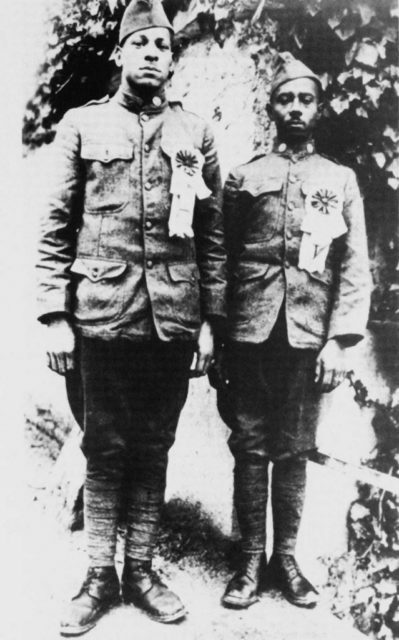 William Henry Johnson and Needham Roberts standing with their French Croix de Guerre medals in 1918. In the early morning hours of May 14th, 1918, Johnson and Needham Roberts of Trenton New Jersey were on guard duty. Just before 2 AM, shots from German snipers whizzed by and they knew the enemy was on the prowl. Right at 2 AM, Johnson and Roberts heard the snip and clip of cutters on the perimeter wire and readied themselves for an attack. Johnson, with a box of grenades at his side, told Roberts to run back and alert the French troops. As Roberts ran, Johnson began to hurl grenades out of the trench, towards the Germans. From the darkness, the Germans responded in kind with grenades and gunfire. Roberts couldn’t leave his comrade behind and ran back to help, but he was struck by a German grenade and severely wounded in his arm and his hip. When he was out of grenades, Johnson fired his rifle. He was hit by answering rifle fire, taking hits in his hands and face. He fired round after round until grabbing an American ammo cartridge by mistake and jamming his French rifle. Suddenly, the Germans were all around, jumping into the trench. At least a dozen soldiers descended upon the two wounded men thought to be inferior by their white U.S. comrades. Johnson, already with numerous bullet holes in his body, proved that notion of inferiority to be completely false. 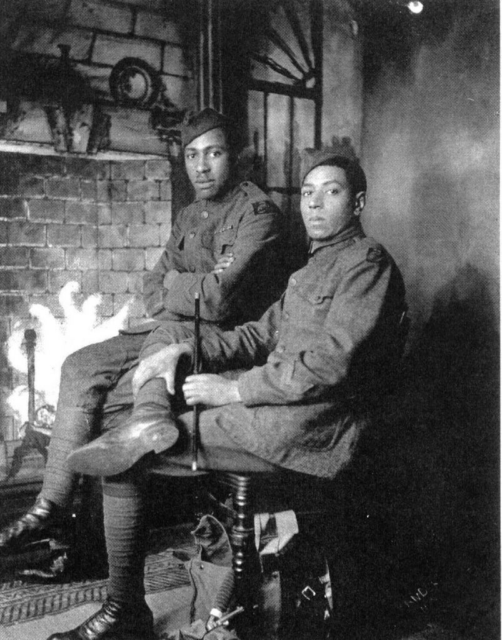 William Henry Johnson and Needham Roberts in 1918. Using his rifle as a club, he swung at the enemy, landing crippling blows until his stock finally shattered. Johnson was hit over the head and collapsed. Perhaps if he had been alone, he would have called it quits, obviously outnumbered and badly injured. But he could see the German soldiers grabbing Roberts, taking him away as a prisoner. Johnson leaped up, pulled out his bolo knife and charged into the enemy once more. The knife he gripped in his hand was adopted by the U.S. Army almost ten years earlier. The Army first encountered it in the Spanish-American war, wielded by native guerrilla fighters in the Philippines. Mostly used for agricultural purposes, this big knife, often between a foot and two feet long, was made by metal workers all across the country. Weighted along the back of its sharp, curved blade, the bolo made an exceptional slicing and hacking weapon that could cleave bones with one well-balanced swing. The Germans in that trench received a quick lesson in just how terrifying this weapon was when wielded by a man committed to fighting to his last breath. Johnson stabbed one soldier in the stomach. He killed an officer as he was shot in the arm. One German tried to tackle him by jumping on his back but instead was stopped by Johnson’s blade between his ribs. Overwhelmed by his ferocity and with the sound of French and American troops running towards the skirmish, the Germans ran back into the night. Colonel Hayward’s “Hell Fighters” in parade. 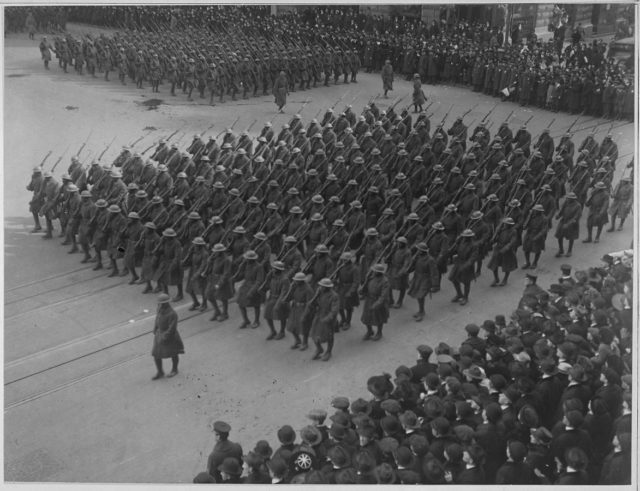 The famous 369th Infantry marching in New York City in honor of their return to this country. As the reinforcements arrived, Johnson collapsed. He had been shot, stabbed, beaten and hit with grenade shrapnel, taking a total of 21 severe injuries in his desperate fight. Upon his return home, Johnson, promoted to Sergeant, lead a parade of 3,000 men from the 369th through New York City to Harlem. More than 500 men of the 369th had earned the Croix du Guerre since Johnson and Roberts and furthermore became one of the most decorated U.S. regiments to serve in WWI. They garnered the nickname the “Harlem Hellfighters.” But despite this, the parade Johnson led was for black servicemen only since they weren’t allowed to participate in the main victory parade. To add further insult to Johnson’s injuries, no mention of his battle wounds was made in his discharge papers. This meant he not only that he did not receive a Purple Heart but also was denied medical benefits due to an injured veteran, even when the U.S. Army was using his story as propaganda for recruitment. A 1946 biographical cartoon of Henry Johnson created by Charles Alston. Because of his injuries, he couldn’t keep a job. Descending into alcoholism, he was left by his wife and three children. In 1929, he died at the age of 32, a discarded American hero. But his memory did live on. His son, Herman Johnson, who served in the Tuskegee Airmen in World War II, along with New York Senator Chuck Schumer and others, fought to have his father’s valor officially recognized. In the 1990s, a monument was erected in Albany in Johnson’s honor and President Bill Clinton posthumously awarded him the Purple Heart. In 2002, the U.S. Army granted him the Distinguished Service Cross, the second-highest honor the military has. In 2015, President Barack Obama awarded Johnson the top honor, the Medal of Honour. The French had long since recognized him as a war hero. Before Johnson’s son passed away in 2004, he got to stand at his father’s grave. Herman Johnson had spent most of his life believing his father was laid to rest in some unknown pauper’s grave. But military records found in 2001 revealed Johnson was buried at Arlington National Cemetery with full honors.